A linguist must decode an extraterrestrial language to prevent global conflict after alien spaceships arrive on Earth. After 12 shell-shaped spaceships arrive unexpectedly to hover over various locations worldwide, Colonel Weber recruits linguist Louise Banks to decipher communications from the extraterrestrials at the spacecraft in Montana. Louise is partnered with theoretical physicist Ian Donnelly. Louise, Ian, and an Army team overseen by CIA agent David Halpern conduct communication sessions with the aliens when their spacecraft opens every 18 hours. The creatures come to be called heptapods for the seven tentacles on their floating bodies. Ian dubs the two beings they communicate with Abbott and Costello. Abbott and Costello always remain behind a transparent barrier. Over the course of their sessions, the heptapods communicate using circular smoke tendril constructs. As Louise and the aliens learn each other’s language, Louise also begins having dreams of a life in which her husband leaves Louise on her own to deal with their dying daughter Hannah. Following the lead of General Shang in Shanghai, other countries begin preparing for hostility and cease participation in the global communication collaboration. Fearing that aggression is premature, Louise and Ian reenter a session with Abbott and Costello for further clarification. Unbeknownst to Louise and Ian, a rogue faction of soldiers led by Captain Marks plants C4 aboard the spacecraft. Abbott and Costello deliver a complex message before ejecting Louise and Ian from the ship as the explosive detonates. Following the attack, the spacecraft hovers higher, preventing further access by the humans below. Meanwhile, China declares war against the heptapods. Ian decodes part of Abbott and Costello’s last message and discovers that the communications at all 12 locations are interdependent. Louise realizes that the heptapods are forcing all of the countries to cooperate with each other for an unclear, but benevolent purpose. However, all international communications are now dark, leaving no way to prevent an imminent initiation of military force overseas. Louise goes outside and enters a shuttle pod that descends from the spacecraft. Costello communicates that Abbott is dying. Costello also explains that they have come to help humanity because they will need mankind’s aid 3,000 years in the future. Louise realizes that the heptapods are capable of opening time and allowing visions of the future. Louise returns to the surface. She explains to Colonel Weber that the heptapods’ weapon is actually the gift of their language. By fully comprehending their form of communication, a person can perceive time nonlinearly and see things yet to come. A memory of an event from her future shows Louise speaking with General Shang at a social engagement. In it, General Shang reveals that he ceased his attack after Louise called his private phone number and broke through to him by repeating his wife’s dying words. Using the number obtained from her vision, Louise steals Agent Halpern’s satellite phone and calls General Shang. Louise explains the heptapods’ true purpose and the international armies stand down. The countries resume their collaboration and the spaceships depart. Although a future memory shows that their daughter will die from an incurable disease and he will leave her for keeping this truth a secret, Louise willingly enters into a romantic relationship with Ian. 12 shell-shaped spaceships have unexpectedly arrived on Earth, hovering over locations ranging from Montana to Shanghai, and everywhere in between where Sheena Easton had a hit song in 1980 (no, really). Who are these beings? Where are they from? Every 18 hours, each ship opens and respective countries respond by sending in experts attempting to crack communications coming from creatures obscured by fog behind a transparent barrier. On America’s end of the collaborative decoding effort, the Army recruits linguist Louise Banks, seemingly a former single mother still recovering from the death of her daughter. Louise is partnered with theoretical physicist Ian Donnelly, whose value to the mission outside of giving Louise a fellow academic to talk to isn’t narratively clear. Though since Ian nicknames the two Montana aliens Abbott and Costello, I suppose he does contribute something of substance to the script. The more time ticks, the more tensions rise worldwide. While Louise works to decipher Abbott and Costello’s written language of circular smoke wisps, the Chinese military readies for war. Louise doesn’t have long left to determine the true purpose behind the extraterrestrials’ arrival. Because a panicked planet is preparing to fire first and ask for forgiveness later. Fair warning ahead for the faint of pace. “Arrival” is the kind of space-related saga whose DNA shares more in common with “2001: A Space Odyssey” and “Close Encounters of the Third Kind” than any alien epic of the rayguns and rocketships variety. The film steps slowly, allowing scope to overtake the senses. What do these extraterrestrial visitors look like? What do they want? And maybe most importantly, what happens next? Through literal and figurative enormity on the screen and in the imagination, “Arrival” captures the wonder of first contact in its first moments with an authentic air of astonishment, awe, apprehension, and terror. “Sophisticated science-fiction” sounds presumptuously pompous. The filmmakers probably don’t even hold their movie in that bright of a light. What that really means is “Arrival” may be a movie with aliens, but it is very much a story about humans. Its cinematic currency cashes in on intelligent introspection as opposed to visceral stimulation. The fiction feels relatable, reinforcing real-world ideas that the direst danger of an alien arrival is not necessarily imminent annihilation. It is challenged religious dogma, tumbling stock markets, and the reactive fear of having our presumed dominance over universal sentience threatened. All of the rightful praise above being said, it would be hasty to equate smart and polished with ‘masterpiece’ and ‘modern classic.’ Time determines the latter. The former on the other hand, is put out of reach by imperfect structure to well-spoken words and well-acted drama. Where “Arrival” could use a wrench to tighten its bolts isn’t so much in the slightly inflated runtime and taffy-pull tempo. It’s in a rushed romance needing more incubation and characters whose narrative purposes could be combined for convenience. (I’m looking at you Colonel Weber and Agent Halpern, the second being a disappointing underuse of “Boardwalk Empire’s” excellent Michael Stuhlbarg.) Flawed flow and contrivance corners not cut notwithstanding, the film still hits the higher notes more critical to effectively evoking emotion through conflict. 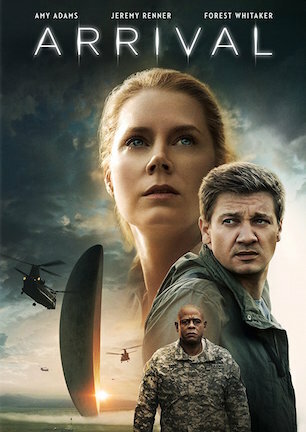 Although “Arrival” is based on author Ted Chiang’s award-winning novella “Story of Your Life,” the movie thematically plays like a stealth update of 1951’s “The Day the Earth Stood Still.” Consider that both stories stem from setups of an interplanetary message meant for international unification, military men quick to misinterpret benevolence for aggression, and political parables of turning a tide of self-inflicted extinction toward self-aware evolution. Then again, it may simply be that despite seven decades of separation, society’s state is so unchanged that cautionary commentary from a Cold War climate remains reflected in 21st-century science-fiction. In which case, the message “Arrival” imparts through enlightening entertainment is a timeless one, more appropriate/necessary/relevant today than perhaps ever, and similarly in danger of the world not reading between its lines. January 24, 2017 by Ian Sedensky.